Representatives from the Dallas County Community College District’s team working on student-centric transformation initiatives visited campus Friday to update employees on progress and hear questions and concerns. The team included DCCCD General Counsel Robert Wendland and two consultants with the Boston Consulting Group. 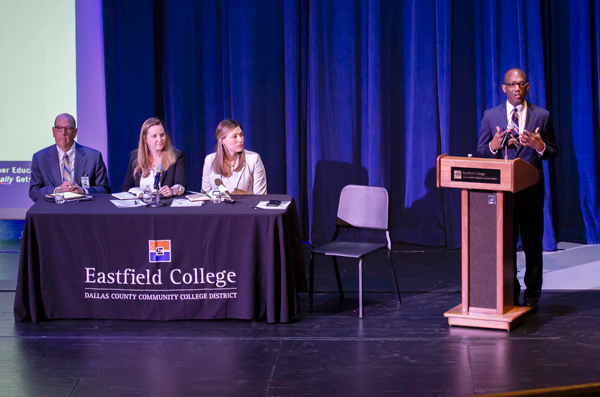 While the event was labeled as a town hall, Eastfield President Eddie Tealer said it was more of a “listening town hall,” as employees would not receive immediate responses to their questions or statements. The DCCCD is expected to respond in two virtual forums March 28 and April 1, both at 4 p.m. The forum began with the introduction, where an employee from the Boston Consulting Group made some introductory comments. Policies impacting faculty were the main focus of the introduction. History professor Matt Hinckley kicked off the comments with a prepared statement about the impact of extra service contracts on employees at Eastfield, particularly faculty. One audience member said she felt the student-centric initiatives had less to do with students and more to do with district employees. The next tweet is two parts. You can view the first portion of the tweet in smaller print on top. … advisers, not the fault of advisers. Wendland and Tealer closed the forum by encouraging more comments and participation from employees on Sharepoint, the Microsoft-hosted intranet used by the district. To view the full thread of tweets, click here.